The phenomenon of the dinosaur is one that continues to fascinate people of all ages. A fun-filled history of the many species of dinosaurs, their eras, and interesting facts about them, this book is not only informative, but funny and captivating as well. Featuring amusing and attractive illustrations, this unique edition discusses a variety of topics, from the Velociraptor and Pterodactylus to the Jurassic Era and dinosaur extinction. This was another review that I did with my six year old daughter, Bug, and it was a hit. The Writing of There Were Dinosaurs Everywhere is both informative about dinosaurs and catchy to an easily distracted ear with its masculine rhyme. Bug is a big fan of books with rhyming stories (I used to only be able to read Dr. Seuss books to her), and she adored this one. 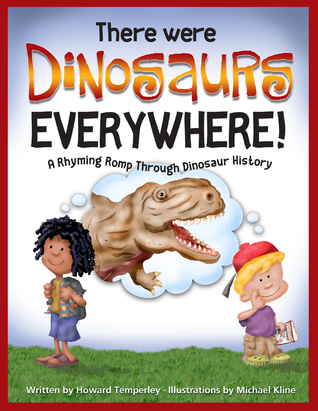 The book provided a wealth of information about nearly two dozen different dinosaurs (in rhyme! ), as well as explained about paleontologists, fossils, and the evolution of dinosaurs. There are also laugh-out-loud parts that are sure to win over even some of the most reluctant readers. The table of contents is specific enough to take kids of all ages back to their favorite dinosaur, and there is a lovely timeline of dinosaurs at the end of the book. Even though I'm not dinosaur expert, I was surprised to learn something from There Were Dinosaurs Everywhere. I never knew that the names of dinosaurs were in ancient Greek. It made me excited to learn something new! The Illustrations done by Michael Kline are well-done and engaging. While Temberley explains that there is no way for scientists to know for sure what color dinosaurs' skin, fur, or whatever was, Kline illustrated the book in such a way that will appeal to both male and female children. There are a few dinosaurs that look a little scary, but they are all cartoonish and very cute. The children and experts in There Were Dinosaurs Everywhere were diverse, and their facial expressions were adorable. I'm usually very picky about illustrations, but this is probably one of my favorite illustrated children's books. You can buy your copy There Were Dinosaurs Everywhere today!